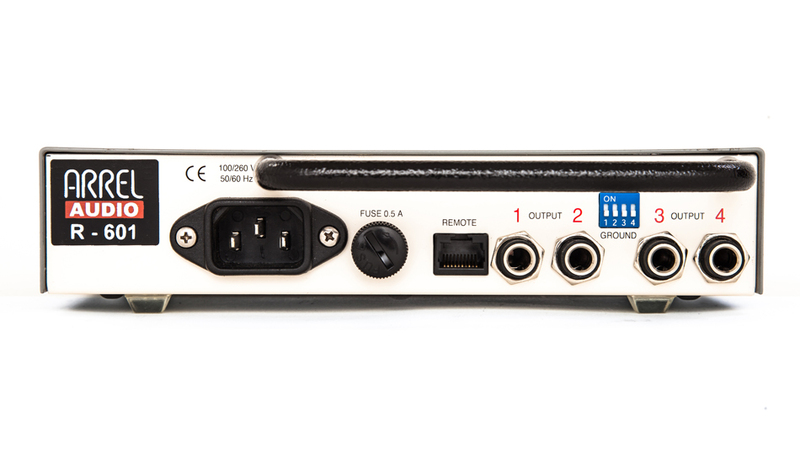 The R-601 is a Guitar/Bass splitter designed for the most demanding professional recording studios where guitar systems, and multiple amplifiers are used simultaneously. The R-601 design, based on four separated transformers, is able to drive up to four amplifiers at the same time without noise and ground loops problems that often plagues most systems. Its high input sensibility allows coupling even with battery powered DI Boxes or with unbalanced low level outputs. This amplifier is characterized by very high linearity and dynamic range, with distortion and noise at the lowest limit, resulting from the use of advanced circuit topologies. Signal level is controlled by a potentiometer allowing a 35 dBu range (-25 dBu to +10dBu). Input and output impedance is calibrated in order to obtain the best pairing with guitar/bass amplifiers. 48V Phantom Power provides power to the DI box if needed. 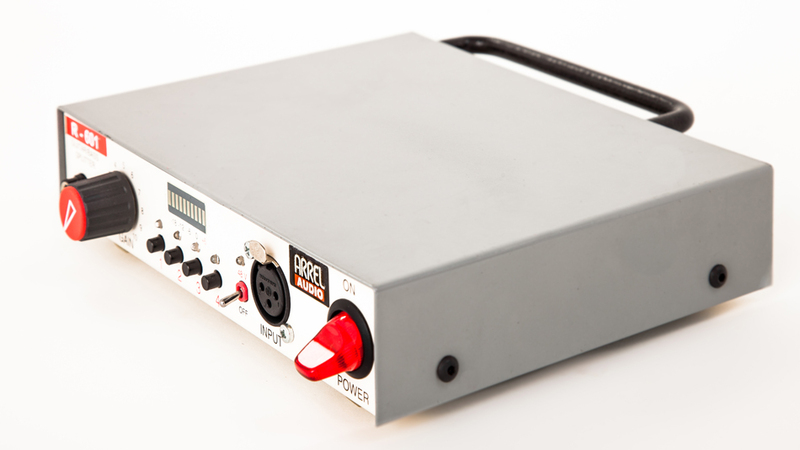 The target amplifier can be selected by using the front panel buttons, a footswitch or by a wireless remote control. This feature allows the musician to switch amplifiers (located in the recording room) comfortably from the control room. 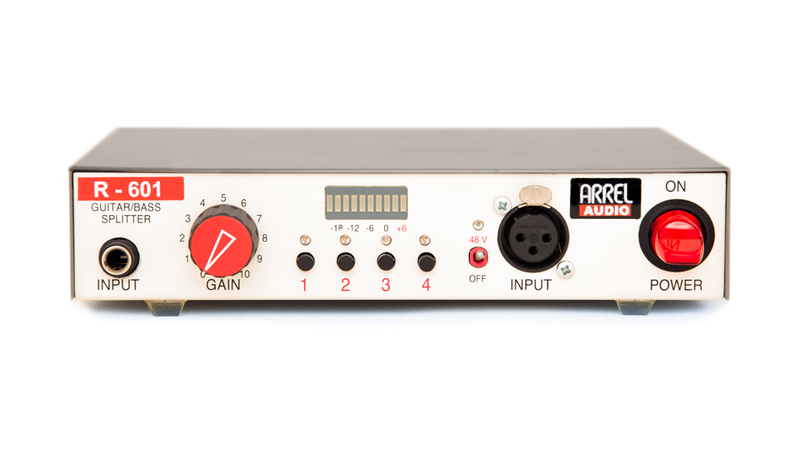 More than one amplifier can be selected at the same time. When the channel buttons are switched off, the remote control (footswitch or wireless remote control) is automatically activated. Operating Voltage 100V ~ 240V ±10%, 50/60 Hz. Hi-Z Gain Range -25 / +10 dBu, Max +20 dBu. Line Input Electronically Balanced, Impedance >10 KΩ. Line Gain Range -25 / +10 dBu, Max +20 dBu. Bandwidth 10 - 30.000 Hz +/-1 dB. Front Panel Controls Gain Pot., 48V Phantom Power switch, 4 Output Amplifier selection buttons, Illuminated power on/off switch. Front Panel Indicators 10-LED Bargraph Level Indicator (7 x green, 3 x red), 1.5dB step, 1 x red LED (48V Phantom), 4 x Output LEDs (yellow OUT 1, red OUT 2, green OUT 3, blue OUT 4). Rear Panel Output Connectors 4 x TRS 1/4"' jacks. Dimensions W 200 mm / 7.87”, H 40 mm / 1.57”, D 140 mm / 5.51”.